The index opened up around the high of the day and stayed in a narrow range only to see some sell-off to the lows of the day at 8268, but closed a bit up at 8299.40, still loss of 23.60 points. The broader market was also weak, with 674 advances to 859 declines. 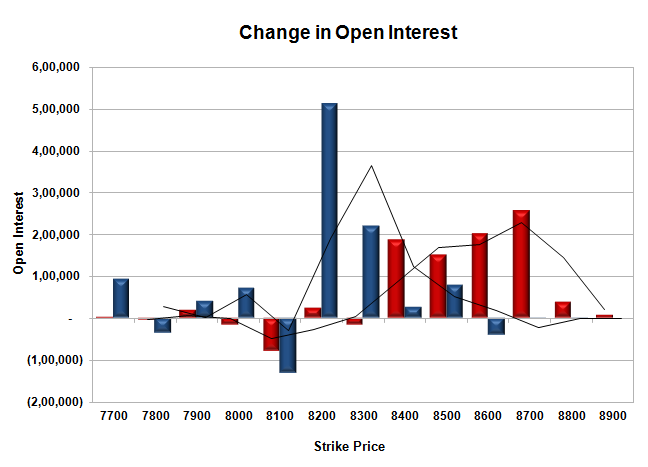 The Larger Range as per OI Table is 8000-8700. Call option 8400-8700 added huge 7.94 lacs OI with small short covering seen at 8100 and below strike prices. Put option 8300-8200 added huge 7.32 lacs OI with profit booking seen at 8100 strike price. 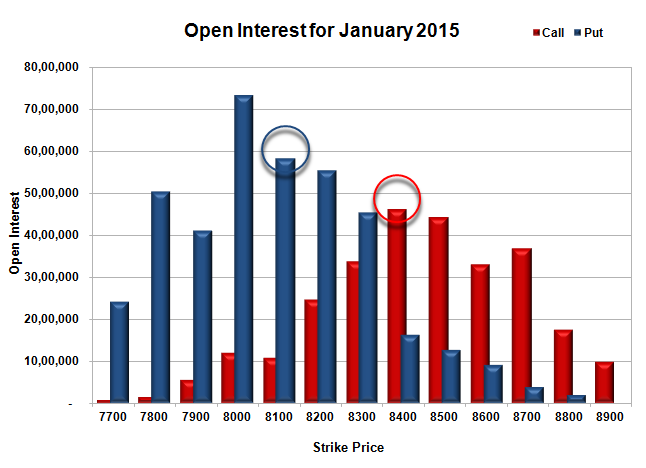 Nifty Open Interest is at 1,79,83,750 up by 4,29,825, with decrease in price, most probably huge short build-up. Bank Nifty Open Interest is at 21,09,800 down by 1,32,550, with decrease in price, most probably huge long liquidation. FII’s bought huge 5.31 lacs Futures, which includes 33824 contracts long build-up and 12582 contracts short build-up, with increase in net OI by 46406 contracts (includes 80826 longs to 59584 shorts for the day) and the Average Price comes to 8645.97. FII’s Index future open contract as on date is 479511 Longs to 116107 Shorts, net long 363404 up by 21242 contracts. Initial and very good support at 8200, with huge OI of 55.38 lacs and below that at 8100 with huge OI of 58.42 lacs. Initial and best resistance still at 8400, with OI of 46.03 lacs and above that at 8500 with OI of 44.30 lacs. 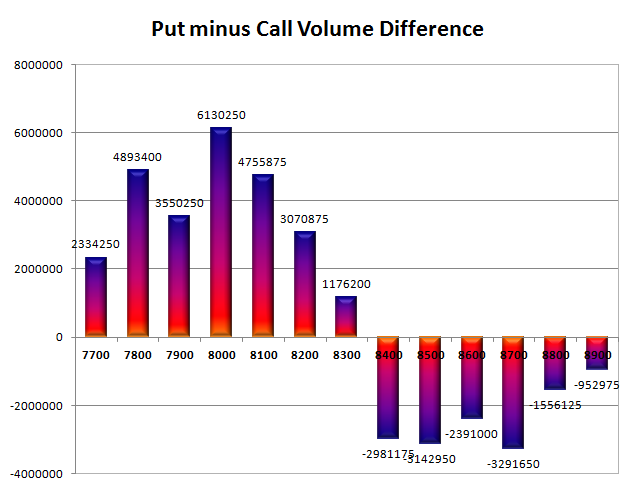 Day Range as per Option Table is 8228 - 8383 and as per VIX is 8228 - 8371 with 8308 as the Pivot.